Just because it's on the Internet, doesn't mean it's true! Anyone can have a web page, and anyone on the Internet can say they are an expert. 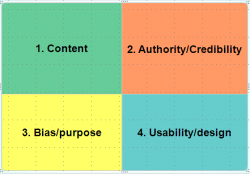 Valid and reliable websites meet basic criteria. Check out Joyce Valenza's two systems of evaluation. Use the BASIC system for elementary/primary levels. 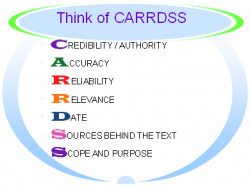 Use the CARRDSS system for secondary levels. Wikipedia is a dangerous place to find information. Wikipedia is a wiki, or an editable page. Any wiki can be freely edited by its visitors. 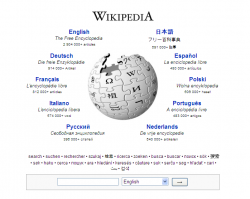 Although Wikipedia has strengthened its safety features, it is still a wiki. Anyone can say they are an expert, edit the documents, or make additions/corrections/changes. Always use web evaluation tools and verify sources when using any information gathered in an Internet search. After opening this file in Word, launch the link in a browser by clicking the Control key + left mouse button. For more information about evaluating web pages, check out the following links or current tags in my delicious account @ http://delicious.com/jpmoore67.